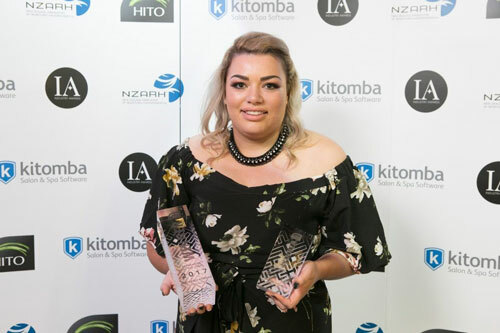 Third Year Beauty Therapy Apprentice Machaela Robbins from Pamper Me MediSpa in Thames has catapulted Beauty Therapy to the top ranking in the 2017 HITO Industry Awards held at the Cordis Hotel in Auckland this week taking out the prestigious National Apprentice of the Year Award – a first for the Beauty Therapy industry. “We were delighted when she won the Midlands Regional Apprentice of the Year and we were simply blown away when she was announced as the National Winner of the Apprentice of the Year for 2018. It’s a huge credit to her and the team for her to get this recognition which impacts both her career and also the industry as a whole” business owner Pauline De Theirry commented. “A lot of people simply don’t appreciate the time, energy, commitment and training that the girls undertake while they are training to achieve the results they do. It’s a huge effort and having Machaela recognised at this level is an outstanding recognition for that effort and for our industry as a whole. At Pamper Me MediSpa we currently have 3 apprentices which really works for us because it means that we get to keep the girls at home in Thames, they get the support from friends and family, it reduces the costs and stress that a lot of trainees experience by having to go away and train in bigger towns and cities and sometimes they don’t have the same appreciation of what it means to be part of a real ‘hands on team’ that working through an apprenticeship framework gives them. Each year HITO, Kitomba Salon Software, and the New Zealand Association of Registered Hairdressers (NZARH) come together to hold the awards and celebrate excellence in business and training in the New Zealand hair and beauty industries. The awards celebrate the HITO Next Generation Talent Awards and the Kitomba NZARH Business Awards. The Apprentice of the Year Award is one of the most prestigious awards that acknowledges the best apprentice in the country within the barbering, beauty therapy or hairdressing sectors. This is the first time a HITO beauty therapy apprentice has won HITO Apprentice of the Year. Pamper Me MediSpa is a national multi award winning salon with a passion for changing lives by providing leading edge services and advanced skin technology.